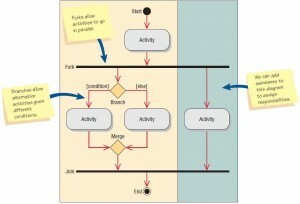 Activity diagrams show the sequence of activities in a process, including sequential and parallel activities, and decisions that are made. 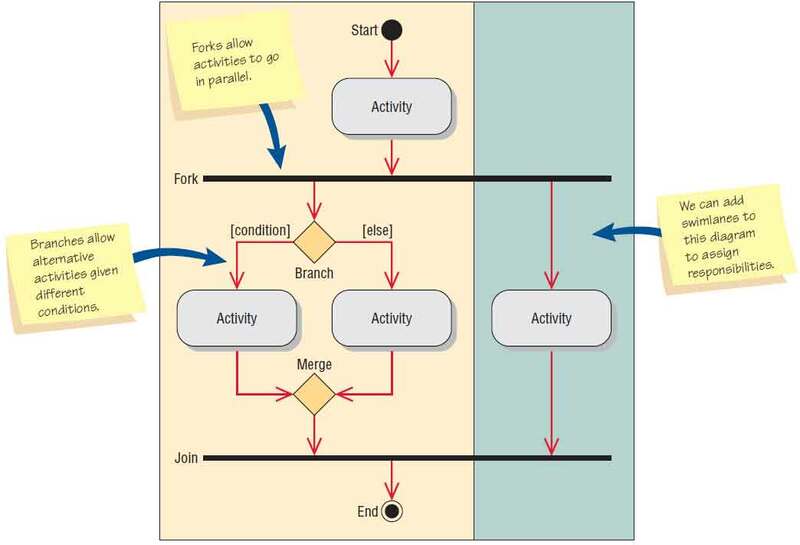 An activity diagram is usually created for one use case and may show the different possible scenarios. 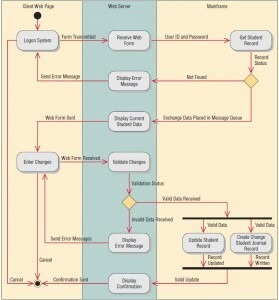 The symbols on an activity diagram are illustrated in the figure below. A rectangle with rounded ends represents an activity, either a manual one, such as signing a legal document, or an automated one, such as a method or program. Specialized symbols are used to draw an activity diagram. An arrow represents an event. Events represent things that happen at a certain time and place. A diamond represents either a decision (also called a branch) or a merge. Decisions have one arrow going into the diamond and several going out. A guard condition, showing the condition values, may be included. Merges show several events combining to form one event. A long, flat rectangle represents a synchronization bar. These are used to show parallel activities, and may have one event going into the synchronization bar and several events going out of it, called a fork. A synchronization in which several events merge into one event is called a join. There are two symbols that show the start and end of the diagram. The initial state is shown as a filled-in circle. The final state is shown as a black circle surrounded by a white circle. Rectangles surrounding other symbols, called swimlanes, indicate partitioning and are used to show which activities are done on which platform, such as a browser, server, or mainframe computer; or to show activities done by different user groups. Swimlanes are zones that can depict logic as well as the responsibility of a class. 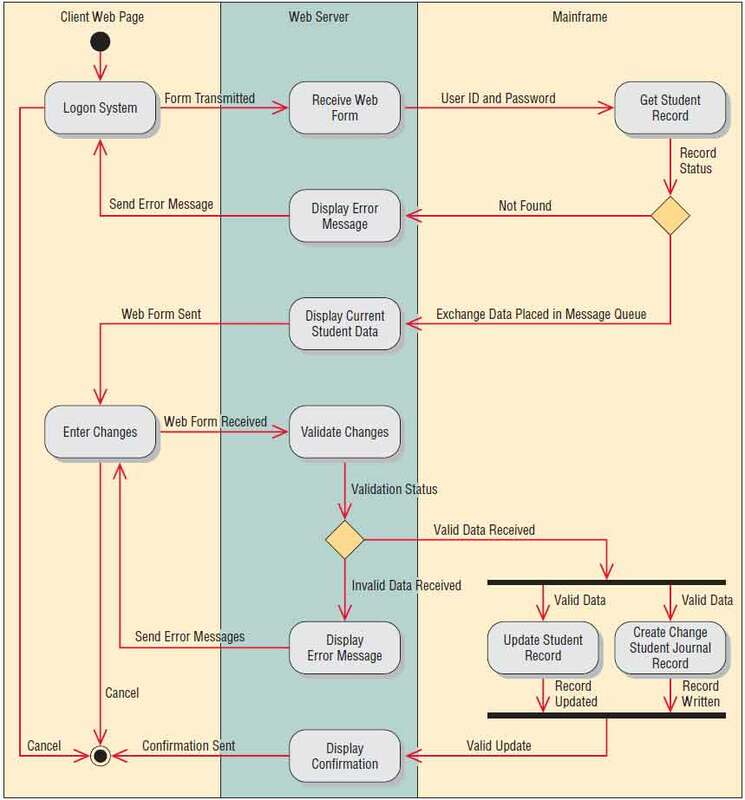 You can see an example of swimlanes in the figure shown below, which illustrates an activity diagram for the Change Student Information use case. It starts with the student logging onto the system by filling out a Web form and clicking the Submit button. The form is transmitted to the Web server, which then passes the data to the mainframe computer. The mainframe accesses the STUDENT database and passes either a “Not Found” message or selected student data to the Web server. The diamond below the Get Student Record state indicates this decision. If the student record has not been found, the Web server displays an error message on the Web page. If the student record has been found, the Web server formats a new Web page containing the current student data in a Web form. The student may cancel the change from either the Logon System or the Enter Changes states, and the activity halts. If the student enters changes on the Web form and clicks the Submit button, the change data is transmitted to the server and a program starts running that validates the changes. If there are errors, an error message is sent to the Web page. If the data are valid, the student record is updated and a Change Student Journal Record is written. After a valid update, a confirmation Web page is sent to the browser and the activity terminates.